with Solomon, her first championship offspring! Shockwave's stunning attributes include elite fleece structure, extreme density, full coverage & high fiber uniformity, along with great conformation & a wonderful personality. 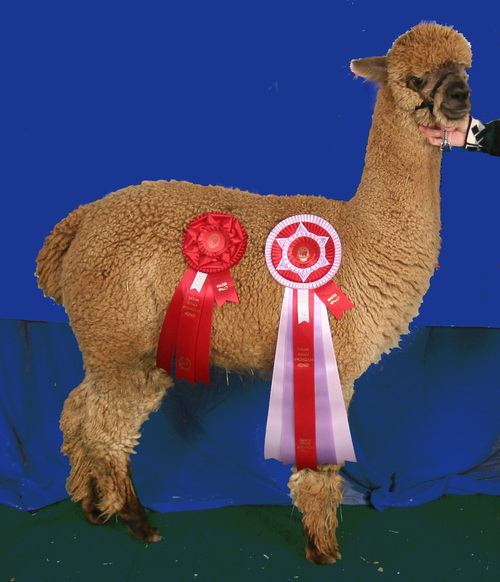 Reserve color champion at 2 shows, Shockwave's fleece scored a perfect 20/20 at the 2005 AOBA National Show for fineness & handle (as an adult), placing second there. Importantly, Shockwave has maintained the fineness of his fiber well into maturity, a trait that he also passes on to his offspring. Shockwave's sire, 4Peruvian Legacy 6016 (now deceased) was a magnificent male, displaying substance of bone, fiber coverage, density & soft handling fleece with luster, uniform crimp & tremendous character. 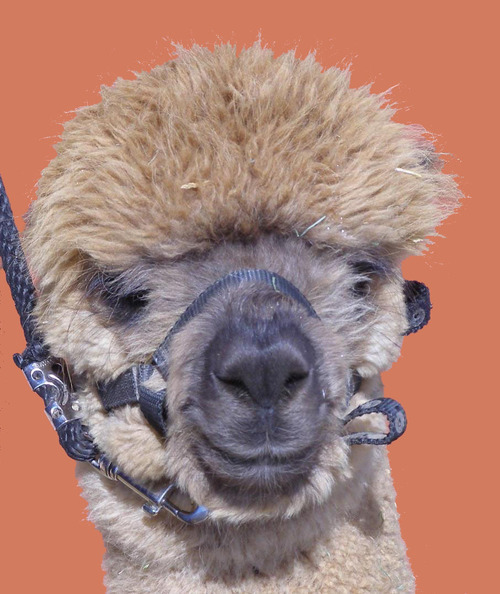 Legacy's dominating presence & regal stature widely impacted the alpaca industry through his ability to pass on his outstanding qualities to his offspring. His offspring, in turn, have honored him with a plethora of blue ribbons & championships. Legacy's record & excellence are undeniable. 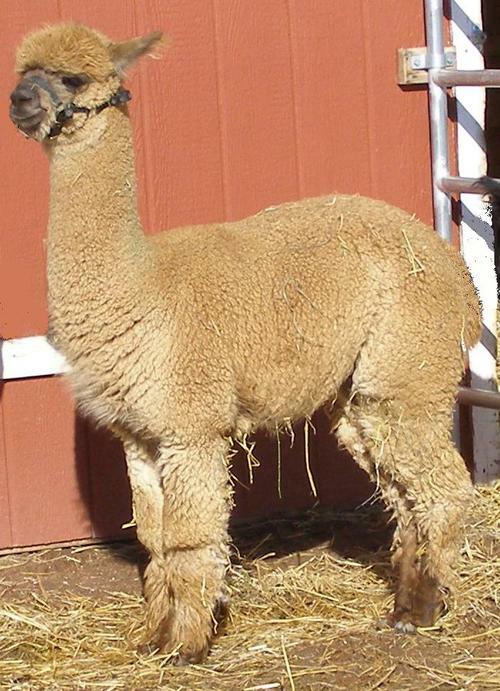 A half-share in Legacy was sold for $750,000 in 2006, making his market-driven price worth 1.5 million dollars & therefore the first Million Dollar Alpaca. 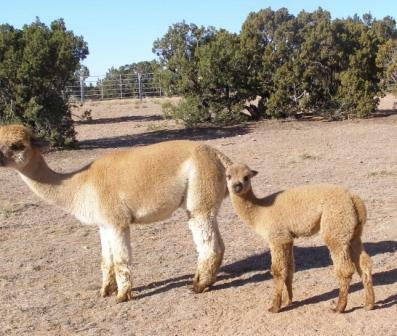 Shockwave's crias have been beautiful - carrying the dam's color & refining the dam's fleece & conformation. The consistently high quality of Shockwave's offspring is validated by the extensive number of awards they have won. Rose has great presence, beautiful conformation and a bright uniform fleece, fabulous genetics from Dave Belt's Echo Mountain and Crescent Moon's 4Peruvian Legacy. She has excellent coverage, armor plate density and a buttery-soft hand just scrumptious to the touch. We fell in love with her the minute we laid eyes on her, even before we got our hands in that fleece. Once we got a hold of her, we knew we had to have her. She continues to hold her fineness and density into adulthood and we couldn't be more pleased with her. 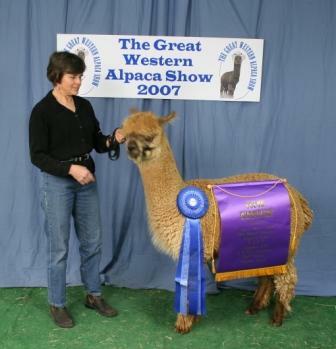 She won BLUE at the Great Western Level V Alpaca Show, May, 2006; took Color Reserve from second place at the Level IV TxOLAN Alpaca Spectacular, February, 2007 and, to our great delight, won COLOR CHAMPION at the Level V (1300 animals - their largest turn-out ever) Great Western Alpaca Show, May, 2007. COLOR RESERVE CHAMPION FROM SECOND IN CLASS at the TxOLAN Alpaca Spectacular in Fort Worth, February, 2007.